This is from a blog awhile back by Jonathan Miller, the director of Chicago A Capella, a very fun and talented professional chamber choir in Chicago. I love the fact that Jonathan talks about music affecting people in a personal way, and I certainly enjoy hearing about how silly music, not just serious music, can make life special (and a piece of mine plays a small part in this). Last weekend, Chicago a cappella had a special performance, along rather unusual lines. A longtime patron was having a big birthday, and his wife hired us to go the Unitarian Church of Evanston for a surprise party and concert. Sometimes it's hard to know if you're affecting someone, but this was not one of those times. The fortunate birthday boy, Craig (who was turning 50) sat up in the front row, enjoying all of it. 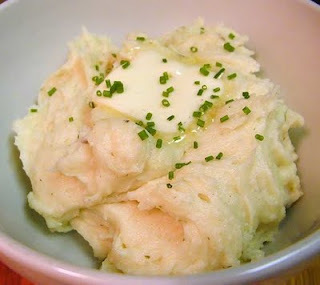 One of the requests was the hilarious song by Paul Carey, "Mashed Potato/Love Poem" from the cycle "Play With Your Food!" We hadn't sung it in a few years, and it was wonderful to once again witness that song's effect on an audience. It was especially touching when Kathryn Kamp and Betsy Grizzell sang a duet that had been written for Craig's wedding thirteen years ago. Then we sang "Happy Birthday" in wonderful harmony, with all the people who had gathered in that reverberant space. At that point, Craig said, "I don't know if my heart can take much more of this," to which I replied, "Okay, we're done!" (which we were). I have often taken pride in the intimate connection we have with our audiences, even with 300 people in the concert hall. This was a lovely occasion when the intimacy was the total point, and all of the singers totally delivered. To Amy, Kathryn, Susan, Betsy, Trevor, Hoss, Aaron, Matt, and Ben: thank you. To Craig and Judith: thanks to you of course, and congratulations, and many happy returns! I heartily recommend CAC for a festive occasion! Almost two weeks later, Craig is still talking about the performance and how moved he was and so are our friends. He laughed so hard at the Mashed Potato song that he couldn't catch his breath and tears were streaming down his face (although that might have been sweat, as it was 95 degrees outside and the church has no air conditioning where the party was held). Doing another visit to a choir premiering a commission I wrote for them- I just feel more and more that the key to a great performance is memorizing the darned music! At the last few clinicians gigs I have done or visits to choirs about to premiere a commission I have written for them I simply get to the point where I just tell them.. put down your scores and just sing! The INSTANT they do this they are watching their conductor better(most of these choirs I have visited recently really do love their directors), hearing other parts better, hearing vowels better and thus tuning better, matching rhythms better,you name it. EVERYTHING is better without the score distracting from the actual music. And we all need to constantly remind ourselves and each other that a score is not music, right? So the next point of my rant is that everyone should be doing their concerts from memory- everyone. Or at least, do some of the concert pieces from memory, and this should even include community choirs, who often give their aging brains as an excuse for not even attempting to memorize anything. From what I have read lately, working the brain harder by memorizing music would be very beneficial for the health of those "aging brains". Memorized pieces will always come off better with an audience for so many reasons, and really do force the weaker singers to do their work. They can no longer hide behind the score and fake things. The message is sent that 1) we are serious about our work 2) let's let our audiences notice this as well when they see us singing from memory. A choir memorizing music will always be capable of far better performances and hopefully be more inspiring to listen to and watch. I recall a choir at the recent ACDA convention in Oklahoma City. Most choirs sing from memory at important events like this and are very prepared with their performances. In addition, they only have time allotted to sing about a half-program anyway. Yet, there was a community choir from the Southeast who read from their scores for their entire performances, and were pretty much buried in their scores. Their results were atrocious and they did not belong at the convention. It was pathetic to see how under-prepared this choir was, but the bottom line blame has to go to their director- he allowed it to happen. If these singers had been made to memorize their music, there would have been no way that they could have slid through in such an underprepared way- I am certain of this. And besides, isn't it a joy to hear people singing beautifully, and isn't it glorious to see the shining faces of an entire choir opened up to their director and the audience as they do so- without their faces buried in a score? I rest my case. I'm guilty of not blogging for about three months- but I have excuses. First was my all of a sudden appointment to teach this summer at the North Carolina Governor's School and second was a major commission to be filled ASAP for the Incheon City Chorale. So here are a few tidbits and updates and I'll try to get back to more regular blogging! I have been chosen to be the commissioned composer and conductor for the Tennessee MENC state honors choir-- for 2015. I am very honored regarding this, and am also impressed that the folks in TN can plan that far into the future. I'm lucky to see two weeks out at a time! More news- my commission for the Incheon City Chorale is complete and is in the hands of the choir in Korea. I am pretty pleased with the piece and hope that they are as well. I'm looking forward to hearing a recording of what they do with it! Three new pieces will be coming out from Roger Dean in early 2010. Winter Solstice (SSA/harp or piano) with gorgeous solstice texts by New Mexico poets; The Star, a very fun setting of the anonymous astronomical parody text of Twinkle, twinkle little star) for SA/piano; and Ding Dong Merrily on High (SATB/piano or harp), very upbeat, in 7/8 most of the time. I also finally got pieces reviewed in the Choral Journal- nice reviews for Roger Dean publications Cantigas de Amigo and Life has Loveliness to Sell. FYI, Roger Dean is always happy to provide free perusal scores to directors and also has a free new releases mailing list you can add your name to- if you need assistance signing up for this, let me know and I will help. We did our final concert at the North Carolina Governor's School on July 24th. This was an amazing program of music about various intertwined aspects of water, war, conflict, resolution. We knew it was an intense program, but I don't think any of us up on the stage realized how amazingly intense it would be with a rapt audience of 600 people in Jones Auditorium. Once again, I was so proud of these 32 singers who never gave up on themselves even when the music was battling us at times in week two of rehearsals. In fact, during their final week of rehearsals they were getting so pumped up about that level of perfection they were seeking that I kind of had to gently cool their jets, as I was afraid they would peak too soon. It was natural for them to be thinking this way, as every night of the final week they were witnessing amazing performances by the dance and theatre groups, and we were the last ones scheduled (for the final Friday night) to show our stuff. I was especially grateful for the parental response after the concert and the fact that Dr. McElreath, head of the school, felt that the choral music performance at the state department of instruction (NC DPI) was one of his own personal summer highlights. We just had our first two concerts at NC Governor's School East. we sang to a packed house two nights in a row and received mind-blowing standing O's both nights. These young singers connected to their audience all night in a variety of ways- straight singing, choreographed pieces, folk music with indigenous instruments, spirituals sung in the best possible manner, etc. what a joy and what fun to see the audience enthusiasm for "classical" music done with style and energy. "Does classical music still matter"? Those two nights it sure did.